Thoughts of wildflower meadows evoke strong childhood memories for me, growing up in the North Downs of Surrey, with its chalky landscape of scabious, campion and cowslips. These happy memories alone would be enough to make me want to recreate my own version at home. But after seeing the display at the Olympic Park in 2012 I can well understand their current popularity amongst garden designers and domestic gardeners alike. 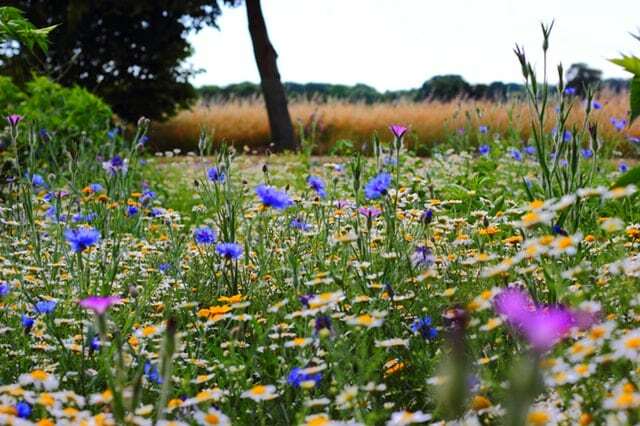 After all, wildflowers seem to offer the winning combination of a low maintenance, ecologically responsible, not to mention very pretty option for any size of open space. But are they really as easy to create and maintain as it appears? Well perhaps, but it certainly helps to have a basic understanding of what wildflowers do and what they need. True meadows are grasslands that support perennial (not annual) flower species which have evolved to flower and produce seed in time for the farmer’s annual cut for hay production – then left to dry alongside the grass, conveniently allowing the flower seeds to shake out and re-set. In today’s ‘garden’ meadows there is a place for the colourful interest of annual species such as poppies and cornflowers, but a yearly task of digging the soil over and re-seeding is needed to continue the display. The main issue to grasp is that meadow flower species need soils with poor fertility. Where soil fertility is good grass will always dominate. At the end of the summer, meadows are cut down to the ground with a strimmer or ideally a scythe, left for up to a fortnight to allow the drying seeds to fall out. The key is to carefully and faithfully remove clippings after this annual cut to prevent enriching the soil further. If your soil is light and poor you have the best start to create your own mini meadow from seed. Richer soil should have the topsoil removed first. After removing all weeds and raking over to create a seedbed, scatter specially prepared wildflower seed mixes suitable for your soil type. Never add fertiliser! A more immediate effect is obtained by laying pre-grown wildflower turf, bought in rolls, although you pay for the convenience. This autumn Holland Landscapes will embark on the second phase of construction of a large country garden near Ongar in Essex. Its steeply sloping contours have been transformed by terraced levels of lawn linked by banks of wildflower meadow. For an (almost) instant effect Meadowmat, a roll of pre-grown wildflower turf, was laid rather than sowing seed on existing lawn. These meadow sections have given the garden context in its rural setting, blending the highly designed garden near the house into the surrounding fields and hedgerows. So why not try growing your own meadow – you’ll be cultivating the latest look, and the bees and butterflies will love you for it.